During a VIP visit to the headquarters of the Strategic Air Command (SAC), at Offutt Air Force Base in Omaha, Nebraska, the Air Force's early warning radar indicates that an unidentified aircraft has intruded into American airspace. Shortly after, the "intruder" is identified as an off-course civilian airliner and the alert is cancelled, but a computer error causes one American bomber group to receive orders for an attack on Moscow. Attempts to rescind this order fail because a new Soviet countermeasure jams American radio communications. With his orders apparently confirmed, Colonel Jack Grady (Edward Binns), the US bomber group's commander, orders them to continue to their target. The president of the United States (Henry Fonda) and his advisers attempt to recall the bombers or shoot them down. Communications are opened with the Soviet chairman in which mistakes on both sides (the orders to the American bombers and the Soviet jamming) are acknowledged. The jamming ceases but the crew follows their training, dismissing the counter-orders they receive as a Soviet ruse. The President struggles to find a resolution that will stop the Soviet Union from counter-attacking; if he fails, a nuclear holocaust will be unavoidable. He offers to sacrifice an American target to appease the Soviets and he orders an American bomber towards New York City. The President's advisers in the Pentagon discover that in doing so, the President is sacrificing the First Lady, who is visiting New York City. A single American bomber reaches Moscow and destroys it. The President then orders General Black (Dan O'Herlihy), whose wife and children live in New York, to make a corresponding nuclear attack on New York, using the Empire State Building as ground zero. After releasing the bombs, Black kills himself. The last moments of the film show images of people in New York going about their daily lives, unaware of the coming disaster. The film was shot in black and white, in a dramatic, theatrical style with claustrophobic close-ups, sharp shadows and ponderous silences between several characters. There was no musical underscoring or any music played, except as radio background during a scene at an Air Force base in Alaska. With few exceptions, the action takes place largely in the White House underground bunker, the Pentagon war conference room, the SAC war room, and a single bomber cockpit (a "Vindicator bomber"). Shots of normal daily life are seen only after the title opening credits and in the final scene depicting an ordinary New York City day, its residents entirely unsuspecting of their imminent destruction, each scene ending with a freeze-frame shot at the moment of impact. The Soviets are not depicted in the film. The progress of the attack is followed on giant, electronic maps in the Pentagon War Room and SAC Headquarters. Conversations with the Soviet Premier (Russian language occasionally heard in the background on the "Hot-Line") are translated by an American interpreter (Larry Hagman). Suspense builds through dialog between the President and other officials, including an advisor to the Department of Defense, Professor Groeteschele (Walter Matthau), an old college friend of the President, General Black (Dan O'Herlihy) and SAC commander General Bogan (Frank Overton). The "Vindicator" bombers (an invention of the novelists) are represented in the film by sometimes stock footage of a real US aircraft, the Convair B-58 Hustler. Fighters sent to attack the bombers are illustrated by film clips of the Lockheed F-104 Starfighter, Convair F-102 Delta Dagger, Dassault Mirage III and McDonnell F-101 Voodoo. 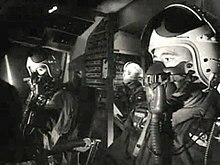 Stock footage was used because the United States Air Force declined to cooperate in the production, disliking the premise of a lack of control over nuclear strike forces. The scene depicting bombers taking off was stock footage of a single B-58 takeoff edited to look like several bombers taking off in succession. A nightmare quality is imparted to many of the flying sequences by depicting the planes in photographic negative. In several of the negative sequences the "Soviet interceptors" were actually French Mirage fighters with Israeli markings. When Fail Safe opened, it garnered excellent reviews, but its box office performance was poor. Its failure rested with the similarity between it and the nuclear war satire Dr. Strangelove, which appeared in theaters first. Still, the film later was applauded as a Cold War thriller. The novel sold through to the 1980s and 1990s, and the film was given high marks for retaining the essence of the novel. Over the years, both the novel and the movie were well received for their depiction of a nuclear crisis, despite many critical reviews rejecting the notion that a breakdown in communication could result in the erroneous go-command depicted in the novel and the movie. Fail Safe and Dr. Strangelove were both produced by Columbia Pictures in the period after the Cuban Missile Crisis, when people became much more sensitive to the threat of nuclear war. Strangelove director Stanley Kubrick, who adapted Peter George's novel Red Alert, insisted that the studio release his movie first (in January 1964). Fail Safe so closely resembled Red Alert that Kubrick and George filed a copyright infringement lawsuit. The case was settled out of court. The Bedford Incident, a 1965 film chronicling the escalating conflict between the captain of an American destroyer and a Soviet submarine in the North Atlantic. ^ Scherman, David E. (March 8, 1963). "in Two Big Book-alikes a Mad General and a Bad Black Box Blow Up Two Cities, and then— Everybody Blows Up!". Life Magazine. p. 49. Retrieved August 18, 2017. ^ Schlosser, Eric (2014). Command and Control: Nuclear Weapons, the Damascus Accident, and the Illusion of Safety. Penguin. p. 297. ISBN 9780143125785. LoBrutto, Vincent. Stanley Kubrick: A Biography. New York: Da Capo Press, 1999. ISBN 978-0-306-80906-4. This page was last edited on 12 March 2019, at 14:34 (UTC).